Chris and I have been part of the “Black Chicken Society” for a few years now. We always receive our spring shipment that includes a bottle of the well known Black Chicken. You know its funny, we have always tried to hold the bottle for a future date. However, we seem to always pull the cork within weeks of receiving the wine shipment. We did again last Sunday! If you are not a Black Chicken Society member you will have to wait. Currently the society is FULL. 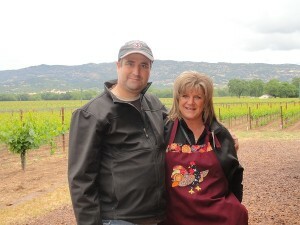 The good news is, Robert Biale winery has created a new club called “The Hatchlings”. So if you want to add your name to the Black Chicken Society waiting list, you have to become a Hatchlings member first. 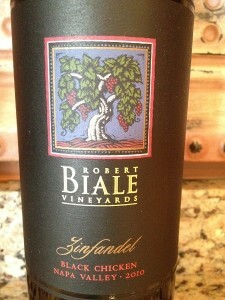 We have scheduled a tasting at Robert Biale winery during our upcoming Napa trip with a few friends. The tasting room at the winery is small but very pleasant. They do have a very nice room to the left that is outdoors and faces a mountain range and vineyard. As you walk in you are greeted by one of the Biale staff and some items for sale. When we frequented the winery last year, Chris spotted an apron that was hand made by Clementina Biale. Of course she did not hesitate buying one. Chris is an excellent chef and loves wearing the apron while she prepares some delightful treats for me! Chris with Mark Biale wearing Clementina’s hand made apron. 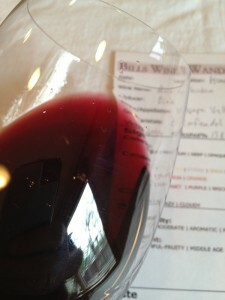 As we inspected the Black Chicken Zinfandel in the glass, the color of the wine was a dark purple. The depth was medium and clear. As we smelled it, we noticed that it was very aromatic and fruitful. We could clearly note spices and BlackBerry. Taking our first taste it was a little dry. 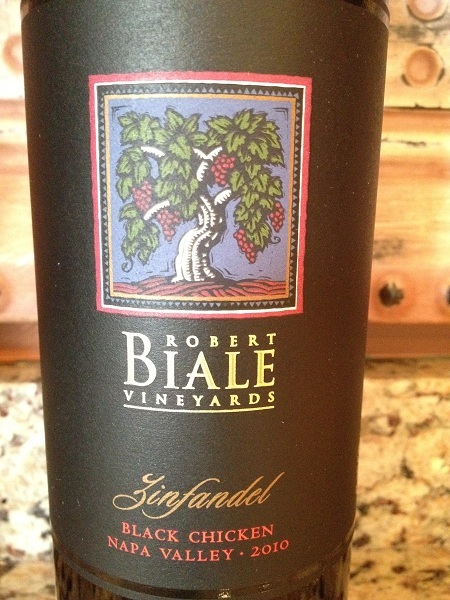 The zinfandel was full bodied and the tannins were medium. I could feel the tannins slightly in the middle and the more on the sides of my tongue. The finish was medium and very nice. We could taste various spices and dark fruit. We served the Black Chicken with pan fried chicken, roasted garlic and red peppers with baked potatoes and onions. The Black Chicken paired excellent with dinner. I had noticed the alcohol content was a little high (15.8%). I do have to say I could not smell or taste the alcohol which was nice! We both have not tasted a better Zinfandel than the Black Chicken. We rated the wine four glasses.